In 2012, Columbus will celebrate its 200th Birthday. Although the city was not incorporated until 2016, the city was laid out by surveyor Joel Wright that year when he created a grid street system that lined up with the small town across the river called Franklinton. Joel drew a line from the main street in Franklinton, and continued that line directly across the river so that whenever a bridge was built that would cross the Scioto, the 2 streets would be in line with each other. Although he didn't name the streets, he wanted that street to be broad enough so that a stage coach could turn completely around in the middle of the street without having to back up. Hence, the reason we call that road today, Broad Street. Mayor Michael Coleman began preparing for the Bicentennial officially in 2007 when he set up a 250 member Bicentennial Commission to oversee the planning of the event and to create a vision for the city for the celebration and the years beyond. The first step had the Commission gathering ideas from the citizens through neighborhood surveys, think tank sessions, symposiums and interviews with fellow citizens at many of the festivals. This was a concerted effort to give the Commission a foundation of ideas directly from the citizens. In January 2008, the Commission held what was billed as a Citizen Summit where 2000 residents came and listened to ideas and then rate those ideas on their importance to the group as a whole. This process will continue throughout February of 2008 through 5 neighborhood meetings where citizens can also express their opinions on the selection process. Once information is collected from the Citizen Summit and the neighborhood meetings, focus groups will be created of between 15 - 20 individuals with special knowledge for specific areas. They will then weigh the info gathered and related it to their specific planning topic. They will then select from 1 - 3 projects or programs to pursue. The Steering Group will then take the recommendations from each of the Focus Groups and prepare a refined set of recommendations. These recommendations will represent the priority programs and initiatives they believe will be essential for the city's future. These proposals should be released to the public in May 2008. Once the Steering Group makes their proposal, the Commission will develop an implementation proposal and set a price tag for that implementation. They will also create a good-faith budget of the costs, and the size of a Bicentennial Bond Package that will be required. That Bond Package will be put to a vote in the general election in November 2008. At that point it will be up to the voters to decide how much they are willing to spend on the future of the city. 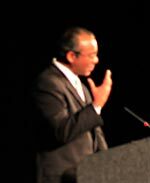 The Mayor presented an enthusiastic vision for the future at the Citizen Summit in January 2008. He dared the participants to think big in ways that will project the city well into the 21st Century.